Thanks to fossil fuels and atmospheric CO2 countless lives have been saved. Millions of people died due to famines in India in the 19th and 20th centuries; however, the relationship of historical famines with drought is complicated and not well understood. Using station-based observations and simulations, we reconstruct soil moisture (agricultural) drought in India for the period 1870-2016. We show that over this century and a half period, India experienced seven major drought periods (1876-1882, 1895-1900, 1908-1924, 1937-1945, 1982-1990, 1997-2004, and 2011-2015) based on severity-area-duration (SAD) analysis of reconstructed soil moisture. Out of six major famines (1873-74, 1876, 1877, 1896-97, 1899, and 1943) that occurred during 1870-2016, five are linked to soil moisture drought, and one (1943) was not. The three most deadly droughts (1877, 1896, and 1899) were linked with the positive phase of El Nino Southern Oscillation (ENSO). Of course Capitalism had nothing to do with it, did it? “The Great Bengal Famine of 1770 (Bengali: ৭৬-এর মন্বন্তর, Chhiattōrer monnōntór; lit The Famine of ’76) was a famine between 1769 and 1773 that affected the lower Gangetic plain of India from Bihar to the Bengal region. The famine is estimated to have caused the deaths of up to 10 million people. Warren Hastings 1772 report estimated that a third of the population in the affected region starved to death. 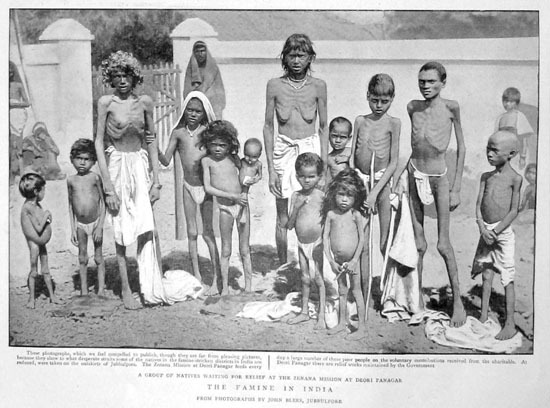 The famine is one of the many famines and famine-triggered epidemics that devastated the Indian subcontinent during the 18th and 19th century. It is usually attributed to a combination of weather and the policies of the British East India Company.” – Wikipedia. Best not to mention the venal interests of a colonial power, but blame a convenient whipping boy in the guise of CO2. You could also look at the way the Irish potato famine benefited the lords, at the expense of the Irish. What the famine had to do with the British east India company I have no idea can you do a sketch for me ? And exactly what either famine had to do with CO2 levels is known only to your ideological self . They never happened before that? Get real Peter F.
Peter is correct, the colonial British were mass murderers. Peter – as he frequently does – relies on the logical fallacy that correlation is proof of causation. The reality of British India was that even at its height, Britons were outnumbered by Indians at a ratio of hundreds to one and only held authority with the cooperation of those that they are supposed to be “murdering. The reality of Capitalism is that it needs lots of productive people creating/growing things to sell….. and lots of other prosperous people with money to buy the things that they need. Neither of these conditions exist in a famine, so to blame famines on Capitalism is nonsense. The Company was a TRADING company. Without the produce of India, it had nothing to trade. Gordo is even further from the mark. The cause of the Bangladesh famine was local weather. The British war cabinet (Churchill was anything but an absolute dictator, and could not set policy by himself – so holding him solely responsible for decisions that he did not have the power to make is neither honest, nor just.) took measures to reduce the severity of the famine as soon as its extent was known and resources were available. The most obvious obstacle to ameliorating conditions were due to a little kerfuffle commonly known as World War Two. Supplies were constrained all around the world – including Britain itself – and the local transport system had been brought to a halt in anticipation of the Japanese invasion. I have to ask what kind of conspiracy theorist imagines that a policy would be based on weather conditions that could not be anticipated, instead of a brutal military invasion that could? Excellent comment PeterW! Thanks for that. Bluddy ell. I never thought anyone could link Britannia with famine. In those days the choice was limited, either England, Spain or Portugal colonised but eventually the poms were the first to grant sovereignty to their colonies, often well before it was wise. But like in the US where there were massive numbers of white mens’ lives lost freeing slaves, there is no appreciation that white men are not always evil. Churchill allowed 3 million Bengalis to starve in 1943 because he thought the Greeks were more deserving of food aid. And why was Churchill the only person that could or might have helped so that now he deserves your modern scorn? Its a question of priorities, history is littered with examples. Did you know that the US singlehandedly prevented mass starvation in 1965? They were truly brilliant. Gordo wants us to ignore the fact that both conditions and capability were enormously different in 1965. A world War is obviously just a technicality to him. Well Peter Fitzroy only a fool looks at past social conventions, sexual mores, politics, and religious restrictions, and judges them with modern perceptions. And I am glad for what good the British Empire did for the world, and saddened by what they did wrong. But at no time should anyone feel any guilt for what happened in the past — we were not there, we do not know or understand how things were done then. As a British born national I certainly will never feel any guilt for what happened, as it did not happen on my watch. We can however look back and learn, and that is the best we can do. The British Empire had no method of stopping that drought anymore than we have today. Yes, more might have been done to mitigate against the drought, exactly what is unknown as we do not know what resources were available at that time. Interesting that you have no criticism of Stalin. But of course no one criticises their own party. And the same could be said of Pol Pot, Mao’s Cultural Revolution, Mugabe’s land reforms, and any number of communist leaders around the world. The tyranny of egotistical left-wing leadership in abusing it own citizens is truly monumental. For them the end always justifies the means. Currently the left is trying to grab technocratic power (control the legislation on ubiquitous 24/7 monitoring via new technology) to foist ‘Big Brother’ style oppression on the citizens of the world. The UN’s Agenda 21 and it’s upgrade to ’2030 Agenda’ lays this out in remarkable detail. It defines the minutia of what the UN oppressors (the UN elites) wish for the citizens of the world. See https://www.naturalnews.com/051058_2030_Agenda_United_Nations_global_enslavement.html for more. Of course nothing of what’s offered there will never prevent or even mitigate the worst of a natural disaster anywhere in the world (the UN’s record is a testament to it’s ineptitude in these matters), including drought, storms, or starvation. “Company rule in India effectively began in 1757 and lasted until 1858, when, following the Indian Rebellion of 1857, the Government of India Act 1858 led to the British Crown’s assuming direct control of the Indian subcontinent in the form of the new British Raj. Conflating imperialism with capitalism is disingenuous. Only if you twice count the one side of the coin you seem to be shilling! Peter: count the children if you want a clue. You blaming that on the “privileged white men” too? Your knowledge level is being shown, yet again, to be basically on EMPTY. and if you HAVE a coin in your purse you probably should attribute it to one or the other. Even the prosperity of more modern China is owed either to local capitalism or the ability of their foreign capitalist customers to have the cash to buy the Chinese products. The indoctrination you have endured truly must have been traumatic. The crap you try to feed me will cause worse trauma. Conflating? Capitalism was coined to describe aggressive Christian colonial slaveholding monopolist mercantilism, not freethinking laissez-faire libertarianism. The tragedy is that the error is a favorite equivocation among intellectuals of the looter persuasion. By their lights, socialism goood, all else baaad. But go ahead and ask any one of them about the Hitler, Ceausescu, Tito, Stalin, Mao. three’ll get you five they reply that those régimes “weren’t really” socialism, Q.E.D. In the beginning there was European imperialism and laissez faire capitalism. Currently there is a push for UN imperialism and a communist style planned economy. How **** does capitalism affect rainfall ? Great that you have shown that drought and famine are a common occurrence in India though. That was exactly the point Jo was making. Nobody is blaming CO2, pfutz. That’s your fantasy. Seems Jo is blaming CO2, for making the lives of people in India much less “fragile”. WOW, all the thing you would “blame” CO2 for. .. that you would deny them these massive benefits? Andy, I have been debating the anti-humanity of the anti-CO2 crowd for many years before I gravitated to Jo’s site. Dozens of times I accused the alarmists of being uncaring of the “third” world and I never once got a considered rebuttal. CO2 alarmists are first world extremists. They only care for their protected lifestyle. They ban DDT because they found some in the fat of a seal never considering that better controls would have allowed it to save millions [billions?] of lives. THOSE LIVES DON’T MATTER the WWF must be obeyed. A case in point would be Adani Coal Mine. This coal is destined to India, to help them provide solid reliable electicity. They NEED that coal, and Australia has pretty much the best quality, least real polluting thermal coal around. And its easy to get at. Without Adani, India has to get the coal from somewhere else. Their own mines displace populations or have to be mined underground, quality not that good either. Indonesia could provide the coal, quite good quality, but much harder to get at. So what the opponents of Adani are actually doing is denying the opportunity of solid reliable electricity to millions of people in a developing country, holding them back from progress..
… They just DON’T CARE. How is anti-capitalism working out for Venezuela? The East India Co. only took control of Bihar from 1765. How were the earlier famines before that be caused in any way by the East India Co.? The British Government sought to control the Company from 1784 (Pitt’s India Act) but only had direct rule of part of India from 1858. Britain didn’t send any food aid to Greece in 1943 as it was under German occupation. That’s why I love this blog. There is always something new to learn. So, capitalism and colonialism cause droughts. Who knew? Peter Fitzroy, Your ignorance and your willingness to misrepresent the truth & history, are appalling. If you has bothered to look at Wikipedia, you would have read that the East India Company fought a series of wars in Bengal on behalf and at the behest of the Mughal Emperors in the 1760′s 1770′a which was the recognised sovereign power of India. Thus the Mughul Emperor in Delhi had ultimate responsibility for the country and for organising, if it so wished, a response to the droughts which lead to the famines. The interesting thing is that governments of all descriptions throughout the world did very little at all. And indeed had not much capacity to anything at all. It was the pre-industrial age with no trains to move grain or major pumps to move water or power generators to provide electric power or heating; or rapid telecommunications to share information. The role of government was basically tax collecting and maintaining armed forces. The rest developed in India over the 1860′s to the the 1990′s. Stop wasting all our time ! bugger off ! You no nothing, and you have learned nothing. I read. It conforms what I said you idiot. East India Company rule in India expanded slowly outwards from Bengal from 1784 until the 1850′s. But even then large swathes of the Indian subcontinent had their own Indian local rulers & princes. After the Indian mutiny Britain abolished EIC rule in those parts of India which it ruled. A Governor General was then appointed by the British government. Yet still large areas of the Indian subcontinet were ruled by their own local princes etc. ( Eg Hyderabad & Kashmir.) right up to 1947. But all this you would ignore in an attempt to pervert the facts. I repeat my opinion of you : you are an ignorant dopey propagandist all to willing to distort the facts & truth to make your point here. I notice that Peter Fitzroy hasn’t made any comment regarding the graph heading this article. Perhaps it sits somewhat uncomfortably with his views. pfutz doesn’t even NO how to spell. So funny. And you are making ZERO point at all, pfutz. ! Your post is, as always, essentially POINTLESS, and not related to the topic under discussion. ie.. it is designed as a trolling attention-seeking distraction. Funny how you haven’t mentioned Stalin starving millions on a whim under his rule…..
Or just another left wing murderous thug? I’ve mentioned it before, Mao allowed 25 million of his people to starve so that he could impress the West with his export strategy. How many times do I have to tell you: Leftists NEVER admit they are wrong or deluded! Fitz will NEVER agree with any point you make no matter how trivial unless you are marching to the same drummer he is. I guess Peter must think North Korea is the greatest Capitalist country of all time. Or that Mao was a great capitalist leader. I mean if Capitalism causes Famine, those guys are at the top of the list. What part of ’caused by droughts’ do you not understand? Peter’s spelling is fine and in his wiki link I found this. Was it caused by a lack of CO2 or monsoon failure? If you choose the latter then I expect a couple of short paragraphs to explain your hypothesis. It often helps to understand a situation by looking at a similar situation that is better understood. Take Rhodesia, set up by the British colonists who did well out of it. The Original Inhabitants got structure and modernity. Now look at Zimbabwe, 2019, with 100% original inhabitant rule. Obviously colonialism has a bad aspect but in general British colonies didn’t do too badly. French colonialism as in French Indochina and Algeria ended in disaster. If we want to go back, Australian Original Inhabitants of 20,000 years ago were possibly displaced by the current, new, original inhabitants. Without looking it up to check I seem to recall that Mungo man may have been able to offer some perspective on that. The constant cry of having been here for 60,000 years may not be all that credible. My parents, grandparents and great grandparents have put a lot into this country without, in any way, causing damage to original inhabitants. Their reward was to see their families educated and given direction in their lives, and believe me, at the time it was something extraordinary. Not many ordinary people could read and write. Undoubtedly there were ugly things that happened and the perpetrators should be shamed, posthumously now. So long ago, maybe it’s time that Everybody picked up an oar and started rowing. Sitting on the bank trying to play the Victim just means you will get eaten alive by mosquitoes. it gives me hope that he may act on more local matters with the same appreciation of our responsibility to support Jo’s blog, not only with words, but importantly, Chocolate. The offer I made a while ago is up again for consideration. Whatever amount of chocolate you buy , up to 500, I’ll double. For the next 24 hours. Same conditions as before. Come on Peter, let’s do something stupid, and useful, at the same time. Nothing “moral” about anything he does. you never know, he spends a lot of time on this blog, maybe there’s something about it that intrigues him. Maybe he will see the situation and do something about it, a turning point. I must admit that it’s only in the last couple of years that I’ve regularly bought chocolate so I’m not in a position to be judgemental in any way. This might be an interesting next 48 hours. I’m sure the ABC and msm won’t report this. Facts that don’t support their biased propaganda are just ignored. We just keep sinking into the Idiocene and rule by the idiocracy. If you donate 50 chocolates to Jo! I can’t afford the amount Keith said! There are No kinks in this. It’s not a challenge Peter, it’s an offer to engage in something useful. Only you, me and the blog operator will know how much chocolate is involved but it would be a demonstration of the sort of behavior you expect of others, a good act. A total anathema to pfutz.. I doubt he has done a single useful thing in his lifetime. Names aside Peter KK’s suggestion is genuine and if you’re concerned about with whom you’re dealing with contacting Joanne would be a good first step, also from KK’s perspective who is Peter Fitzroy? A serious question though, from your political beliefs (whatever they be) do you consider the major Communist leaders in history did a good or bad job of running a country? For the communist question, I would suggest that in both Russia and China, the lot of the average person has improved dramatically. These were both peasant agrarian societies before their revolutions, and have achieved parity with the west in a shorter time frame than it to the west to achieve the same level of improvement. There was a huge cost in life, not comparable with that in the west, although I will point out that the massacre of native, or ethnic populations is a feature of western civilisation. There goes that fantasy world of yours again, pfutz. Most gains made in these countries were due PURELY due to developments coming FROM Western civilisations. Of course the gains were faster than those who had to do it all themselves. Right pfutz, like massacres never happen under communist rule. ! Communism has brought about most of the largest genocides in world history. Over 2 million workers went on strike at one time in 1905. (Including about 500 thousand in Russian occupied Poland). Hardly indicative of a wholly agrarian economy. The bolsheviks relied on workers to gain control of the country. Their attitude to agricultural peasants showed up in the (Soviet induced) Ukrainian famine. And China lost 50? 60? million during Mao’s great leap forward but industrialisation really expanded in the last 30 years. It is good policy not to try and increase output by killing the workers, something Pol Pot didn’t realise. Out of a population of 125,640,021 for Russia and around 21,000,000 in Poland. I’m not disputing the loss of life, only pointing out that everyone was doing it, only difference being that the colonial powers mostly did it to their subject races. So it’s OK if the communists do it to the subject people???? Of course not, but this is a case of the pot calling the kettle black. Funny how they managed to keep it quiet. Peter – before you proclaim the Russian peoples better off after/under Stalin, try reading any of the works by people who lived during that time. Even Nikita Sergeyevich Khrushchev had a few things to say about how the regime did NOT really make things better for many/most. Massive famines due to collectivism, lysenkoism, sheer stupidity. Populations of entire areas packed up and moved. I can’t even get into the taking of lands and peoples with both political skullduggery and engines of war – which created non-natural famines. Don’t see where anybody even raised the matter of colonialism. There is plenty to criticise with the Company, and much of the criticism was made in the press and parliament of the era. Nonethless, the Skull Famine of the early 1790s was connected to monsoon failure and to climatic conditions felt at the new settlement of Port Jackson. Same in 1896 and around the turn of the 20th century. I think we don’t need to go over again what happened in NSW in 1896 and what the Fed Drought was like. The heat and drought of the late 1870s went right round the globe, killing millions in China, India and Brazil. There was nobody European in Oz to record what the monsoon failures of the early 1780s was like here, but the Chalisa Famine killed up to ten million in India. We know there was extreme drought on the sub-continent, that Mt Laki was going off at that time, and that it was a bad time for crops in all kinds of places about the globe. The Deccan famine of 1630–1632 may have been worst of all about which some details are known, and this occurred under Mughal rule. I’m not here to defend colonialism or the East India Company or neo-liberalism generally. Hell, the Second Fleet was a bigger swindle than any of the crimes punished at Botany Bay, and that certainly made the El Nino a bigger disaster. This does not reflect on all the colonialists, some of who we can still remember with pride. Whatever corruption or mismanagement was involved in the Indian famines during the Company years and the raj, monsoons fail and always have failed, despite the peculiar New Climate beliefs. With colonial powers you get good and bad. If that’s what you want to talk about I’ll talk about it on an open thread. The point being made here is that monsoon failure and El Nino related disasters are not new. It took Australia only a couple of years of settlement to find out all about that. And who even needs Nino? In 1939 we had a full set of heat/fire/drought disasters and ’38-9 was a La Nina year flanked by neutral years. Really, the globocrats need to stop inventing a New Climate. It looks to much like the old if you check…and some of us check. Oh, and Green Blob must be destroyed. And let’s call it the way it looks, that’s exactly what the save the world types don’t like. There are too many people for them. Homo sapiens have become too successful and they know there’s no way to persuade enough people to voluntarily cut down the birth rate so a more drastic thinning of the herd is the only other choice. We have elevated ourselves to and then way above our level of competence, clear to the point where the powerful and would-be powerful are not just about lording it over as many of us as they can. It’s now to the point of wanting to watch while the excess population dies off and making sure that result is inevitable. How ironic it is that homo sapiens means “wise man”. As you do, so you are. Your actions speak for you every time, not your words. Can anyone tell me I’m wrong? Norman Borlaug versus Paul Ehrlich,food shortages in India. The accomplishment speaks for itself without any help from me. Paul Ehrlich was saying in the 1960′s that the world couldn’t support 2.5 billion people. Economies would collapse ( only partly due to oil running out) and cannibals would be roaming the mid west of the USA. He also claimed Climate Change would make things worse (although at that time it was Global Cooling). He’s still at it. Over 50 years of prophetic failure. Probably a personal hero for Peter Fitzroy. I suggest we are missing the point of Fitz’s arguments and misrepresentations. He is trying to create major bloody distractions from the main thrust of Jo’s post. Long before CO2 had increased significantly. By contrast In the past 30 odd years when CO2 has risen ‘alarmingly’, there have been NO MAJOR FAMINES ! Of course this is a major blow to the increased CO2 = Catastrophe Alarmist Greenist fairy tale. Well your game is sprung Fitz. Bugger off and think of something else more intellectually honest to do here. SO..Instead …….. DISTRACT . DISTRACT…. DISTRACT…. Reminds me of the cautionary tale of Brer Rabbit and the Tar Baby….. I doubt pfutz has a clue what that means. Fitz is trying to make the point that CO2 had nothing to do with mass starvation in India. Do you disagree with him? No, pfutz is trying to make some erratic political claims in a vain attempt to DISTRACT from the topic of DROUGHTS in India over its history. And yes, the increase in CO2 has almost certainly had an positive effect on food growth and yields especially in the last century. This is proven by thousands of experiments. CO2 is not part of the equation, droughts in India come about because of monsoon failure. Yep, it is the response to the monsoon failure which prevents death from starvation. Thank goodness the Brits were there to help, hey pfutz. ! CO2 is very much a part of forming resilience against drought and monsoon failure, as is technology, fossil fuels, regular solid electricity, better seed stock etc etc. Note, ALL those things in the last paragraph came from western capitalist civilisation. So BAD of them. !! So we can all agree that monsoon failure is the cause of mass famine in India. The Klimatariat say its unpredictable, but Ian Wilson hopes to prove them wrong. I think there is a connection between the droughty conditions in India and the MDB. Top End monsoon failure might give a clue to what is happening and what to expect in the year ahead. No, it is the willful misrepresentation that I’m protesting. British colonial policy was to maintain exports at the expense of the local population (not only by Britain, but they had India). This was done by the British, in Ireland, Africa, India, Burma, and Malaysia. To say that those deaths was solely due to a drought, when food exports were maintained is wrong. As to the claim of ‘ but but but… those nice company (under a royal charter) men only took tax revenues – in what form did those revenues take? Was it in kind? ie taking the crop, or did they buy the crop and then demand their tax revenue? The other point is that all this stopped around the time that India gained its independence, and was able to benefit from the green revolution. You are not even on topic. The topic is DROUGHTS in India. There was never any “Green” revolution in India. You are living in a fantasy, yet again, pfutz. Stay on topic and STOP the petty attempts at DISTRACTION. MORE DISTRACTION, DISTRACTION, DISTRACTION, eh Fitz ! The last British ‘sponsored drought’ & famine was in 1944. And fought the Japanese instead. But frankly I don’t care. Under independent Indian Congress governments. And improved varieties and fertiliser. Got any proof? of are you just a blowhard? Topic is DROUGHTS IN INDIA. !!! So, the so-called “Green” revolution was about the UK and US HELPING India to improve its food supply. Capitalism is so bad, hey, pfutz. !!! They had of course been doing that for quite a while, by helping to increase atmospheric CO2. This is the true “green” revolution, enabling the world’s biosphere to expand through the increase of atmospheric CO2. Why exactly are the leftists trying to stop this happening? Now, about those droughts, which have been frequent through India’s history. ! What is the cause of monsoon failure? Strong El Nino appears to be implicated. On further reading the models suggest you are correct, this abstract talks of stochastic influences, white noise and a random walk. Yes there are very probable links between El Ninos and monsoon variability. But seeing we haven’t quite figured out the how, why and when of El Ninos, it can only be put down to weather variability. Ypur knowledge of Irish history is slightly wonky. I was reading recently that when Robert Peel was in Ireland in 1816 he came to the conclusion that the Irish were heading for disaster due to ingrained beliefs and a refusal to change. They relied too much on potatoes, and there had been famines in Ireland before that when the crop failed. That didn’t stop him when PM from trying to alleviate the famine, but the news from the west of Ireland took weeks to reach London, and it was a considerable time before the extent of the potato crop failure was realised, even by the Irish who left potatoes in the ground over winter, and found that they were rotten only when they went to dig them up. (The Irish had switched to a high yielding variety which was most prone to disease, whereas the rest of Britain had other varieties and less losses). Incidentally, the famine was far worse in the SW of Ireland where British control of agriculture was least. The grain that was exported came from the East where British influence and methods were most evident, and was allowed because the starving Irish didn’t eat bread and had no way to make it anyway. It was also thought that the income from the export would help provide food for the starving. So you are blaming the victims for not being able to make bread? They were certainly too poor to buy it. These were mostly tenant farmers, paying rent to English landlords on very small holdings of 1-5 hectares. The tenants were made to pay their rent, even though the crop had failed, exactly the situation in India. Famine less bad in places where British were able to help. Now, the topic is harsh DROUGHT and its prevalence throughout India history. More like 1 hectare farms if that. This applies also to Irish owned land. The Irish idea of subdiving land equally between descendants reduced the options of agriculture to that. That, and choosing the most productive variety regardless of disease resistance (or taste). Raising potatoes was easy work by the “lazyboy” method – hilling up the soil and covering the plants as they grew. Crop stored in the long strip of raised land (which is why disaster took some time to be realised). People live in ditches with roof. Highly unsanitary especially with the resident pig which was the common annual rent. As for collecting money from people who usually didn’t pay their annual rent anyway must be your idea of a joke or a complete failure of logic. Where the farmers adopted british methods, very much in the East and in Ulster, there was no famine. They had grain, the infrastructure to handle it, and the necessary equipment to produce bread. That they were exporting grain to England surely indicates there wasn’t a shortage, and with the Corn Laws giving them a higher price than the famine affected areas could pay, what were they supposed to do? Transport of grain to the SW would have been very slow to impossible on the existing roads. It took weeks to get from the SW to Dublin. Peel got rid of the Corn Laws and organised imports from abroad. Not much use where people lived on potatoes, milk and whiskey. Your beliefs seem to come from a comic book. And I have Irish ancestors on both sides of my family, although some generations ago. As to travel, why not use the ships? There are ports all around the coast, and shipping was a lot faster and more efficient. As to the peasants, you are blaming them for their lot, which was a common political trope at the time, as it is now. When they left the land, or were unable to pay the rent, their landlords consolidated the holdings (at no cost to themselves) and adopted better agricultural practice. Sailing ships Peter, don’t go very well into the wind. Anyway who was going to send grain to the other side of Ireland in the hope of getting paid, maybe. Far better to import grain from abroad, as was done. But distribution was difficult. There is the little matter of disease esp. cholera which seems to have killed many. Did you miss my comment about unsanitary conditions? And when people from England commented on sanitation bear in mind that London also had a cholera outbreak about the same time, so the situation in Ireland must have been dire. This wasn’t the only outbreak of famine in Ireland, just the worse. Figures are unreliable but about a million dead out of about 8 – 8.5 million. The previous worse one was in 1740 and about 1 in 12 died. Peel foresaw that disaster was coming in 1816 as the population was expanding rapidly and he applied Malthus to the situation. But he still tried to help, belatedly or not. The population of Ireland dropped for nearly 100 years after as people fled overseas (including my ancestors). And it continued to drop even after English rule ended. As for a landlord consolidating his holdings? What does that mean. And they couldn’t adopt better agricultural (as was the case in the East and in Ulster) practice where the land was owned by the Irish. Your whole assumption is that people then had modern beliefs, modern transport and communications, and thus are guilty for not doing what you think (in hindsight) should have been done. arguing it is unrealistic, out of touch and expensive. “The ABC test drives an electric car from Perth to Augusta to see if it can go the distance on Australia’s vast regional roads without running out of juice. “Modelling undertaken for ARENA and the Clean Energy Finance Corporation found that even if the Government doesn’t intervene in the market, electric cars would account for 29 per cent of new sales by 2030. “The modelling shows a “moderate intervention”, through tax benefits and emissions standards, would see a 49 per cent share by 2030. “Environment Department official Kristin Tilley told Estimates on Friday that those forecasts would be realistic under the Coalition’s Climate Solutions Package. “Before Josh Frydenberg became Treasurer, he heralded an electric car revolution was coming to Australia and that current projections would see a million electric vehicles on our roads by 2030. “Dr Anna Mortimer from Griffith University said the Labor’s Party’s 50 per cent target was the same as that introduced by the UK Conservative Government, while the Netherlands has set a target of zero emissions from cars by 2030. The same scientists who told us diesel cars were the magic bullet for doomsday global warming are now telling us that electric vehicles are the magic button? “Yellow vest” demonstrators gathered in Paris and other big French cities on Saturday for the 21st round of protests since the movement began. Get your yellow vests out, Australia! Ergo, the deadliest floods were AFTER 1924. That’s weather bingo for ya, theres always deadly warming around the corner. Hot, cold, wet, dry – no matter. Something we all tend to do, and probably shouldn’t, is to apply contemporary standards to history. If the picture at the top of the thread were Africa today, we would be horrified. We would, I believe, as contemporary civilized folk say to ourselves “this must not happen”, and marshall the resources that ‘capitalism’ has provided us to ameliorate the suffering. Absent warring warlords, or socialist dictators, for whom famine is a weapon, aid would be forthcoming. But this photo is from history. There is no way to roll our semi trailers or cargo planes back to 1896. There aren’t any NGO’s, who sometimes bridge aid to folks hard to help directly for political reasons, that have mastered time travel. If the lesson is said to be that our modern institutions are useless because their forbears didn’t solve this problem, we have a thoughtless person with an agenda who should probably be kept from children and sharp objects. There are some points one might make to a group of formative minds learning to understand the world. We think this is awful because we see a picture. Photos entered life in the early 19th century. There were frequent, repetitive, unimaginably worse disasters in the far past, but we have only word pictures to inform us. If the people of New York were to collect food to donate, and provide ships to carry it, and send it off the an Indian port, it would like not be deliverabe on the other end in-country, nor arrive in time. Before the age of steam, timely delivery would have been recognized as impossible, and no attempt would have been made. Famine, and the means to alleviate it, have been understood for millenia. Drought as well. Both are discussed in the Bible, and in the seminal documents of other cultures. The only known solution was to store food and water in good times, so it would be avaible in bad ones. What did people think about these things when nearly all life was local? What are the tools we have today to deal with nature? Disasters consistently happen, but they destroy, on a per capita or percentage basis, less and lass life and property. In order to help others, we have to have more than we need, so we can give some away. Yet some people say this is not efficient, and we should only have exactly what we need. If we have a local disaster, we have to have more than we need, so even if some is destroyed, there will be enough left to get on with, or we shall have to depend on others having a surplus and being willing to help us. Before we talk about politics, we should talk about logistics. We are constrained by the world. We are also constrained by what we think about the world. To help us understand the famine picture, how would we find out what people thought in 1896? The evidence shows that fossil fuels have been a God’s gift to mankind. Even the emissions from such has been and continues to be mostly positive. Yet, the green blob dreams of the days were natural catastrophe cause wide spread death and destruction. Were populations were reduced to a fraction of what they were because they had no surplus available to sustain them selves. So it had been over the bulk of the lives of man on earth. Yet, it was one short century of a needlessly limited capitalism and another century growth of technological civilization, that the population of the earth exploded beyond all imagination. During that time, the only major catastrophes were and are cause by wars between competing dictatorships rather than people simply wanting to live and have their children to live. The “Little Ice Age” coincided with the Maunder Minimum approx 1645-1715 AD and the Spörer Minimum (1450-1540). Extreme and deadly weather events abounded during this period. CO2 was not the issue. There was a decline in solar flux. In 2009, I predicted that there was a 1-in-4 chance of a mega-famine in India. Catastrophic multi-year failure of the Indian monsoon has caused at least eight mega-famines in India over the last 1100 years. Historical data shows that seven out of the eight mega-famines have either started within ± one year of the year of greatest asymmetry in the Sun’s motion about the Solar System’s centre-of-mass, or 11 years ± one year after this event. The Sun is currently experiencing a maximum in the asymmetry of its motion about the centre-of-mass. Evidence is presented to show that there is almost a 1-in-4 the chance that there will be another Indian mega-famine in 2018–20. While the chance of such a catastrophic event occurring is small, it is large enough that the governments on the Indian subcontinent should take precautionary measures to confront this potentially devastating threat. If there is a strong El Nino this year, it could exacerbate the situation. A fascinating part of the book’s second half deals with the effect that the almost unbearable heat had on Kipling’s health, which accentuated his ever-present hypochondria. So natural disasters in the past were worse in the past because we we terrible at dealing with them. I never knew. Good thing fossil fuels and all the massive development that came with them are still in place in our country, hey little-geegee. !! Still many places in the world that need this civilisation promoting electricity, wouldn’t you agree, little-nag. Thank goodness that China is willing to help out in that regard, while Western civilisations have dropped the ball because of an imaginary CO2 miasma. Western civilisation has helped MANY countries start the climb out of third world status, yet now the AGW agenda would have the west taken back down to a lower standard and would have that assistance stopped. Just DUMB. yup. So, in short, the effort we’ve put into development has mitigated the effects of disasters. Hey you havn’t responded to my comment in the other thread. Hit refresh so you can find it. Which one particularly do you want me to respond to?. Humans are an ingenious lot, the 1965 near disaster was averted by the singular effort of President Johnson. ‘The USDA tapped logistics specialists who had served in the Army Quartermaster Corps in the Second World War. They leased an Esso supertanker longer than a football field, the Manhattan, and anchored it in the Bay of Bengal to act as a floating harbour, because India’s ports were insufficient to handle so vast a scale of imports. ‘Trains delivered US Midwestern wheat to ships awaiting them in Galveston, Texas, and New Orleans. About two ships a day left for India, more than 600 in all, according to Brown’s 2013 memoir, “Breaking New Ground”. They docked to the Manhattan and emptied their grain into it. Thirty-foot boats called dhows then filled up with grain and carried it up the Ganges. About one-fifth of the US wheat harvest in 1965 was shipped to South Asia. India produced only 77 million tonnes of grain, 18 million tons below the official demand projections. In this discussion, it is important to understand the difference between human-assisted mega-famines and natural mega-famines. Human-assisted mega-famines are the case where political decisions have exacerbated food shortages. Natural mega-famines are those that result from the failure of the Indian Summer Moonson for more than 2-3 years in a row. Precisely, this tutorial has gone off the rails by raking up the political past, when we should be focussed on paleo climate history. 100% sure that was the intent of the first post of the topic. Fitz kicked off with a non sequitur and out witted us. Let’s keep an academic eye on the drought, there won’t be mass starvation. “It is clear that the risk of below normal rains is building up. We are not sure if it would necessarily materialize. But if that happens, it would create a downside for growth and upside for food inflation,” said D.K. Joshi, chief economist at Crisil. This is obviously climate change. “We’re currently experiencing a dry, multi-decadal phase of the Indian monsoon and haven’t seen an unusually wet season in 25 years,” said Todd Crawford, chief meteorologist at The Weather Company. The opposite to drought is recorded on a 35 metre pole in a park in Gympie, Queensland. Dozens of floods scattered throughout the century have their heights marked. Absolutely no sign of change. Big floods a century ago; a huge flood in 1990; no indication of global catastrophe or change.